PIXMA MG5500 is a printer with advanced Wireless1 Inkjet Photo All-In-One printer with clever design provide a combination of high performance and real comfort. Print beautiful, borderless2 photos up to 8.5 "x 11" and crisp documents with exceptional quality. The MG5520 offers a 4800 x 1200 maximum color dpi3 technology with 2pl, five individual ink tanks and ChromaLife100 + systems. If the color runs out, you replace only the ink tank that you need. Plus, Edge Snap feature allows for quick access to the ink tank for easy replacement. By "LCD screen 2.5, MG5520 lets you view your pictures before you print, and fix your photos with Auto Photo Fix II. PIXMA MG5500 is equipped with Canon PRINT application convenience, 4 which allows you to print photos and documents from your mobile device. 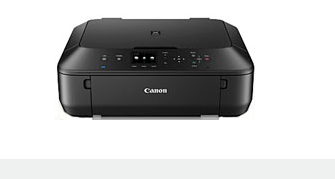 With cloud printing functionality you can print directly from select online popular Cloud services such as Picasa Web Albums ™, Flickr, Facebook, Twitter ®, Dropbox ™, etc., either in the printer itself or with your mobile device using the free app PRINT Canon. AirPrint5 allows you to print directly from your iPhone, iPod touch ® iPad® or wireless, while the built-in Wi-Fi® technology allows you to print and scan wirelessly1 from anywhere around your house. MG5500 Wireless also offers Auto Power On, a convenient feature that automatically powers up the printer every time you send a photo or document to be printed. PIXMA MG5500 also comes with me Images Garden8 software that puts all your favorite printing features, such as special filters and Full HD Movie Print6, in a single, easy software application. Celebrate the memories of your life by making a special mold of your treasure trove of photos and videos. My Pictures Garden8 also help you organize your photos with calendar view and facial recognition. Plus, creative templates in various combinations of colors and patterns help to inspire your photo projects. Additionally, you will have access to CREATIVE PARK PREMIUM9 where you can download exclusive creative projects and content.